If you slip, trip, or fall on someone else’s property and sustain serious injuries, you may be entitled to compensation. It is important to seek the help of a trusted injury lawyer as soon as possible. 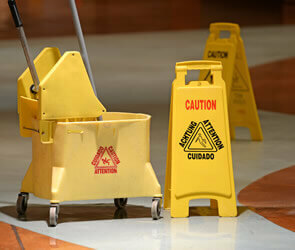 There are two main factors in a slip and fall case, negligence (liability) and damages. If you can prove that the property owner was negligent, then the owner may be liable for damages for your injuries, and you may be entitled to compensation. The amount of compensation you are entitled to will depend upon a number of factors such as whether you sustained any broken bones, fractures, required surgery, incurred any additional expenses, lost any income etc. Your injuries could be the result of a tripping hazard such as a raised sidewalk slab, bunched up entry rug, slippery liquid or substance on the floor, or even by snow or ice in the winter. These tripping hazards in turn could be the result of poor building design, insufficient lighting or a failure to keep the premises clean. In many cases, injuries occur in busy, high traffic areas, such as malls, grocery stores, gyms, sidewalks or streets, though they can also occur in private homes or offices. For a free, confidential assessment of your case. Who is Legally Responsible for Slip and Fall Accidents in Ontario? There can be some exceptions such as when the negligent actions of someone else caused your slip and fall. This is why it is best to seek a consultation with an experienced personal injury lawyer. Learn more about Occupier’s Liability in Ontario, Canada. Seeking compensation through the legal system with the help of a Slip and Fall lawyer can help cover the financial hardship of these injuries, including lost work time and medical bills. Where Did Your Slip and Fall Occur? Property owners have the legal responsibility to keep their premises clear of hazards so that you are reasonably safe while on the premise. Property owners include provincial governments, municipalities, commercial property owners, and private property owners. By law, Ontario municipalities are required to keep roads and sidewalks properly cleared and are liable of any injuries caused by improperly maintained roads or walkways. The same holds true for other premises including public transit, airport terminals, and parks. If your injury happened on city or government of Ontario property, it is important to provide notice within 10 days of the incident, or as soon as possible thereafter. For municipal property, written notice should be provided to the clerk’s office. For provincial property, the notification should be provided to the Ontario Attorney General. Be sure to keep a copy of any notice letters you send along with proof of mailing (i.e. return receipt). Our slip and fall lawyers at Michael’s Firm would be happy to provide this notice for you. Commercial properties such as restaurants, bars, and malls are required to keep their property safe and free from any tripping or slipping hazards. Injuries caused by wet floors, uneven flooring, construction work, poor lighting, and other hazardous situations could be cause for legal action. Private property owners have a similar obligation as that of stores and businesses to keep their property safe for friends, family and visitors such as repair people. Essentially, a homeowner is required to make sure their house is reasonably safe for visitors. In most cases where injury occurs on private property, insurance coverage is available. In Ontario, landlords are required to keep their property properly maintained and may be legally liable for slip and fall accidents resulting in injury due to hazardous conditions. How Much Compensation Can I Expect After a Slip and Fall in Ontario? Coverage of medical treatment, including past, ongoing and future medical expenses. Pain and suffering damages currently have a cap of approximately $370,000 in Canada. Loss of income is another common inclusion in a personal injury settlement. If you were unable to work after your injury or lost wages, you can be compensated for this. Family members may also receive some compensation if your slip and fall injury caused them to incur expenses or they spent time caring for you. What Should You Do After a Slip and Fall in Ontario? Slip and fall cases are some of the most common personal injury civil cases in Canada. Most often, these cases settle before trial, with only a small percentage ending up in Court. If you suffered an injury due to a slip and fall on someone’s property in the Toronto area, you may be able to receive some compensation and you should seek legal counsel from an experienced personal injury lawyer. Fill out the form on the left side of this page or call our Personal Injury lawyers at 1-647-495-8995 for your free and confidential slip and fall case evaluation. Plus, our Toronto and Hamilton personal injury lawyers only collect fees once they win or settle your case.